Business travel can be an costly investment, but your business can maximize VAT reclaims to optimize expenditures. Foreign VAT charges are targeted at citizens who live in each country your traveling employees visit, so when your employees pay VAT on goods and services as part of business travel, the business is entitled to file a VAT return to reclaim those funds. You’d be surprised at how much your company’s VAT refund can be worth. Many companies overlook VAT reclaim on business travel expenses because each amount or receipt is relatively small. As a result, though, as much as £15.3 billion of potential VAT refunds go unclaimed every year. 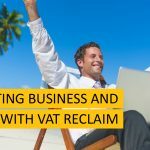 Once you start investigating the value potential that VAT reclaims can bring, you’ll identify more business travel expenses that you can add to the VAT return. You’ll want to include every possible business travel expense to make the most of your VAT refund. Here are four types of business travel expense that you might not have considered, but that you’ll want to add to your VAT return to maximize your VAT reclaims. Not surprisingly, VAT costs vary greatly from one country to the next. In some countries, your employees will be charged VAT at a rate of 25%. Certain countries will give a VAT refund for flight crew expenses, while others will not, so it’s worthwhile to investigate the legal differences between countries to maximize your VAT refund on all the business travel expenses that are eligible. When your employees travel for ongoing professional training, trade shows, or seminars, you can make a VAT reclaim on nearly all of their business travel expenses, including the cost of their flights, hotel rooms, and taxi rides (in most countries, but not all.) In addition, you can also request a VAT refund on each employee’s participation fees in the professional education event they’re attending. That means that if you’re paying for your Chief Information Security Officer to take part in a prestigious but expensive cybersecurity training seminar in Zurich, you can claim VAT on all of his or her registration costs for the event. This is a little-known area of VAT reclaim. Imagine that your VP of Business Development is on a business trip to Amsterdam to sign a major deal with an important potential client. Millions of pounds are riding on this meeting. Just as he’s leaving his hotel, his suit jacket catches on a nail and rips across the lapel. Fortunately, his hotel has an in-house dry cleaning and mending service, so he steps in and waits 10 minutes while they carry out an invisible repair to his ripped suit. They do an amazing job – but they also charge an amazing amount for it. Your organization can include this business travel expense on your VAT return. You can also request a VAT refund for shoe repair and other clothing repairs, like fixing a broken heel or repairing a ripped seam. Depending on your team’s business travel purposes, they might need to utilize specialist services during a business travel venture.This could include employing the services of consultants, lawyers, tax advisors, or other experts. For example, imagine that your VP of Business Development’s meeting in Amsterdam went very well. The client was impressed and is ready to sign a contract. Your team wasn’t expecting such immediacy, but nobody wants to miss out on the opportunity to strike while the iron is hot. Your VP find a local contract attorney and requests her services to immediately prepare a contract that abides by the laws of the Netherlands, the EU, and your home country. With her help and some remote input from your in-house legal department, your VP is able to prepare and sign a contract worth £14 million, scoring a new and very lucrative client for your company. It more than makes up for the high fees that the local lawyer charged for urgent work. Thankfully, your company can claim back the VAT on its VAT return. When you’re making a VAT reclaim, you don’t want to overlook a thing. For all the details about purchases and services that you can include on your business VAT returns in the EU and other countries around the world, download our eBook.